After lots of “let’s do this sometime soon”, I did it! This past Saturday, my sister Staci, Amanda and I got together and took on the September Menu from Once A Month Mom. The overall outcome: I think we all agreed that as long as the food tastes good & heats up well then it was definitely a good thing!!! And so far I would have to say that the Once A Month Cooking from Once A Month Mom has “Worked for Me”! It was a long day. It took a lot of planning. BUT LOOK AT THE END RESULT!!! Have you ever seen so much food?!? We were probably on the high end of everything. It took us about 11hours & we spent a little over $300 (combined). However it was our first time. I would definitely imagine we could shave some time & money off that in the future. The Extra Person – The way I understood everything, the Once A Month “guidelines” are really intended for 2 people. However, we used three. This helped us on time – although it took a long time, it no doubt would have taken a lot longer without that third person. Amanda was “Person A”, Staci was “Person B” and I was the human dish washer!! It’s not like you have time to run the dishes & I don’t know who in this world would have the amount of dishes & utensils needed to pull the day off, so an extra “human dish washer” worked out well. It also helped with expenses. When it was all said & done, I spent $116 for over 18 meals (plus about $15 on some Ziploc Freezer Bags & Baking Trays). And I promise you we will not feel a shortage of food by splitting it among three people!! For starters, the meals are designed for 2 families of four. Amanda & I each have our husbands, a toddler & a one-year old … so in terms of “eating” our families aren’t considered “of four”. My sister is single so between all that we have PLENTY of food!!! Table/Counter Space – My kitchen is not huge by any means, but I would say that I definitely have a fair amount of counter space & it definitely helped. I even brought up an extra 6′ folding table that I had & we got alot of use out of that. By the end of the night we had food lining up around the floor & on the fireplace!! The Food Processor – Amanda borrowed her Dad’s Cuisinart Processor. Very early on we realized she should have borrowed her Dad too (he’s awesome in the kitchen!! ), but since she forgot him the Processor would have to do … and it did! Chicken, Apples, Pears, Veggies … chop, chop, chop! Amanda also had her smaller prep one & it got used as well! The Electric Griddle – My husband uses this all the time for big breakfast meals, but I’m not a huge fan … too much clean up for me:) But we were flippin Silver Dollar Pear Pancakes like crazy woman (a whole other post all by itself) with that thing! But it gave us alot more room to keep working on the stove. The Whole Program – A Menu, Instructions, A Grocery List … how could that not work for me!! Sure, Montery Jack Cheese wasn’t on the grocery list(unless all three of us just looked over it every time) & we had to make a midnight run, but my goodness have you seen everything that is done for you!! Tricia even checked in on us via Twitter to make sure we were ok … how sweet is that!! It’s Already Done – I have so much food … AND it’s ready to eat (we’ve already enjoyed several items) or give away (I already gave two dishes to my parents because they watched the kiddos so I could pull the day off)! And they loved both their meals!! So, there’s lots more I could say about it and hopefully ohAmanda & Simply Staci will post on it soon too! But for now that’s just a brief synopsis of our Once a Month Cooking Day & why it worked for me! Thanks Once A Month Mom!!!! For more Works-for-Me Wednesday Posts or to link up to your own, visit We Are That Family! It’s the week of Halloween. And honestly, I only get excited for Halloween for two reasons. One – It’s one day away from November. Which means it’s 15 days away from my birthday, 20-something days away from Thanksgiving, and less than 2 months away from Christmas. To me, Halloween means the real holidays are officially here!!! Number two – I get to dress my kids up! I was never that into dressing up throughout my teenage/young adult years but I love thinking about the kids’ costumes! So in honor of Top Ten Tuesday, here are my Top Ten (ok maybe I can only think of ten so they all made the list – but what’s the difference?) Halloween Costumes! 1. My first halloween costume memory is only because of pictures … I was dressed as a cookie monster. 2. My second, is once again because of pictures … we did something (a church carnival probably) with OhAmanda that year, and basically every year after that. Amanda & I were sweet angels or fairies … I forget exactly. But I remember that we were pretty, sweet, & cute. My sister on the otherhand was a witch – hahaha … guess she drew the short straw:) I have one picture stuck in my head that I cannot find but her face is NOT happy about being that witch. Staci or Amanda, do you have a copy?? 4. 2005 was Evan’s first Halloween. He was just 2 months old & all I ever heard was “oh my goodness he looks so much like his daddy”!! At two months old I had no intention on dressing him up. However, I found this adorable “little pepper” bunting costume & couldn’t pass it up! 5. In 2006 Evan was into everything, including Curious George … he was our own little Monkey! I found this costume at Old Navy. I love home-made, put together costumes, but Old Navy has some really, really cute ones!! 6. In 2007 Evan was all into Zebras! However in our household they’re simply called “Stripes“. Old Navy once again came to my rescue & Supplied this cute little costumer! 7. Then in 2008, Evan was all about cowboys & horses. So of all random places, I found this costume at Cracker Barrel random, yes! He still wants to fit in it today but his belly pops out & the pants looks like he’s ready for the great flood, but he loves it! Not sure why this is the best picture I could find! 8. For Megan’s first Halloween in 2008, all I could manage to get her in was a little hat. So she was the “carrot top” to Evan’s Horse. 10. Megan will be supporting big sister & dress up like a Cowgirl … plus the girl LOVES shoes & she’s got a really cute pair of boots that she hates to take off! So if you’ll be dressing up, what will you or your kiddos be for Halloween? Or what are some of your personal favorites from year’s past? 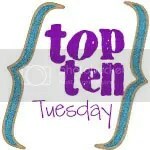 For more Top Ten Tuesday lists or to link up to your own, visit ohAmanda.com. Today is Monday. That means tomorrow is Tuesday. Which means … this Top Ten Tuesday-only blogger chick will strike again!! I think that’s about the only thing I’ve posted the entire month of October!! Maybe I like lists!! There’s plenty to blog about. I’ve been at T-ball games with Evan, did our first Once A Month Cooking with ohAmanda & my sister, hosted a Pampered Chef Party, have had plenty of play-ground days, hosted a Pumpkin Party for the kiddos … and all other sorts of stuff. The problem is sitting down to actually write the posts. I guess if I want to be a blogger I’m going to have to work on that!! Today is my sister’s birthday!! We are two years apart. It’s true what your parents say about “one of these days” you’ll love each other!! Because while I probably always loved her growing up, I certainly didn’t appreciate her as much as I should. Growing up we had our share of fights – most of them started off in the bathroom that we shared. So in honor of Staci’s Birthday, I’m dedicating this Top Ten Tuesday post to the Top Ten Characteristics I love about my big sis!! 1. Her love for her nieces & nephews – seriously! She does the coolest, most fun, most thoughtful things for all her nieces & nephews. If you want to be a cool aunt, you’ll have to copy everything she does but then do it with all your heart … and you might be close! My two little ones are so incredibly blessed to have her as an Aunt!! A family get together is never just a get together if Aunt Staci is in charge … here’s just one example! 2. Not only do her cupcakes & cakes taste good – but they are always so cute!!! It’s fun having a “cake person” in the family. She always out does herself for the kids’ birthdays!! I know it’s always going to be cute, home-made, and made with lots of love! 3. Ministry – She is such a giver!! She’s always been involved in ministry & hasn’t let her job or other responsibilities slow her down. If it’s for something or someone that she cares about, she’s there! Puppets, drama, stick ministry, small groups, children’s church, outreach, Camp Rocks, Square Peg, Mission Trips … you name it, she’s done it! I know any youth or children under her lead are lucky, lucky, lucky! 4. Friendship – Just like a ministry cause, if a friend is in need of something she’s always there! She has supported countless girlfriends as they get married – I honestly think I would go broke (and a tad crazy) buying all the bridesmaid dresses, shower presents, plane tickets, etc. that she has or all the baby & wedding showers that she’s hosted, but her friends love her & want her to be a part of those days & she loves her friends & can’t help but do anything less than extraordinary for them. 6. She is full of integrity, grace, compassion and just fun!! 7. Martha Stewart & a bag of chips! She’s like my personal closer!! My dreams are always bigger than my ability! So basically everything I start, she finishes for me. And then there are those times when I know I shouldn’t even start the project … so I don’t. I just call her. It’s always cute. Cute. Cute!!! 8. She’s around six graders all day long – I don’t see how she does that!! But I know for a fact she’s an awesome teacher!! 9. She’s a tad Vain – I’m KIDDING!!! But she can definitely take an entire roll of pictures if she like her outfit one day:) Here’s a little proof! 10. But the best part of all … she’s my Sister & my Friend! I’m very lucky to have her … Happy Birthday Staci!! You’re an awesome sister, aunt, friend and person. I love you very much & hope you have a great birthday!! I pray this is an awesome year for you!!! For more Top Ten Tuesday posts or to link up your own, visit ohAmanda.com. It’s so sad whenever he starts going through these questions because it’s obvious he dreamed something about me, a Ferris Wheel, and a boo-boo on my arm the night before. I try to explain to him that my arm is ok. You had a bad dream & I’m really sorry that it made you sad but nothing happened to me. My arm is all good – see?? We normally continue in that circle for a minute or two. Then he’ll forget about it. Until the next time he has that dream again and we start the cycle over. The Fair is coming to our town this weekend. I love fairs. I love everything about the fairs – the food, the rickety rides that have been making the circles for years & years, the people watching, the food, the people watching, watching Evan (and now Megan) have fun, the food, the people watching and did I mention the food?!! BUT, just in case my son is by chance a prophet … I will be staying far, far, away from the Ferris Wheel!!! *Update – Everything went pretty much exactly as I thought it would. We walked into the Exam Room and about the time the door closed Megan starting crying – no screaming!!! It’s as if EVERY single doctor’s visit the last 13months all rushed into her brain & she associated that little rectangular room with all the other visits – the dozens of visits to the Pediatrician, the 4 visits to the ENT Doctor, the 1 visit to the Neurosurgeon, the 2 visits to the ER, the one visit to the OR … and now a visit to the Cardiologist! She had had enough & they were the ones she was going to let it out on!!! And that she did! Literally – I don’t think she ever let up!! The nurses & doctor were so incredibly good with her. They tried their best to comfort her so they could do all the little tests – blood pressure, oxygen, EKG, ECHO, etc. etc. We had books, stuffed animals, & suckers. The main doctor even gave Megan his cellphone – he had a video of his son singing his ABCs & he put it on a LOOP for Megan to watch during the entire ECHO procedure … she actually started laughing at it at one point. We have to take this cute little girl (the one on the right) to the Cardiologist today. Her doctor noticed a slight murmur and wants us to get it checked out. I really like her doctor alot but this won’t be the first time that we’ve gone to a Specialist to get something “checked out”. I know Dr’s have to protect themselves and more times than not that means referring us to a Specialist so they’ll be protected!! But at the same time, I’d rather be safe than sorry so I’m ok with that!! So to the Cardiologist we go today. I’m actually not nervous about the results at all, but I am extremely nervous about Megan staying calm enough to actually run the tests!! Megan, doctors, & calm don’t usually go together! If she doesn’t stay calm enough then they may have to put her to sleep & I really don’t want that!! They have her scheduled for an EKG and then if needed an ECHO test. I hope everyone has a good day & I’ll update later. Reviews – do you write them? do you trust them? Have you ever written a bad review? Did you publish it? Or have you ever read a bad review on someone else’s blog? Have you ever been invited to a blog event hosted by a company (what’s it called Junket, or something like that – new to me!) and written poorly of the company? Did you publish it? I received my college degree in Marketing. The time I spent in the work force after graduating until I left after becoming pregnant with our 2nd child was brief. It was all of six years. So I am by no means coming at this as some Marketing Expert and not even as a Marketing Expert wanna-be, but rather just thinking out-loud … (and maybe with my marketing “cap” on – not brain, just cap!). 1) we were a third party. While you likely would have never heard of the company I worked for, you very likely have heard of all our clients – Fortune 50,100 & 500 clients. So we sold the fact (to our clients) that we were a third party & therefore they stood a much better chance of getting honest, real opinions because the participants weren’t talking with the person that created the product or idea but a third person that was not biased & was impartial either way. Also related to this, we sold our location – studies & interviews were conducted in a neutral location – not specific to the client or brand … i.e. you didn’t walk through the Coca-Cola doors & drink a Sprite during our study. And 2) that we screened for qualified participants. We had to find a range of individuals that fit the client’s target market through surveys & background information. While we kept a database of potential participants we shuffled through them & would not use them repeatedly (within reason) . We would even throw participants out of the database or pool for future studies if they weren’t ” good”. For example – there is such thing as a “Professional Participant” – they “know” what to say & how to act & what they think you want to hear; however, they don’t know that you can pick up on that and see that they’re being fake in their answers. And then there’s just the bump on a log that can’t communicate enough so you have to remove them because it’s like pulling teeth to get any kind of feedback what so ever. So maybe much of this is just because it was drilled into my head for six years that this is how it should be but I seem to struggle when I read a product review on a blog … and maybe that’s because the majority (not all, but definitely the majority) of the ones I read are all good! How is that? Is it because they’ve only been given awesome products and there’s nothing bad to say about them? Is it because even if they weren’t great, they’d still write a great review because they don’t want to ruin any PR relationships? Is it because the only reason someone would want to enter a giveaway is if the reviewer likes what they’re giving away? Is it because they reviewed bad products dozens of times but just never wrote the post so all you see are the good ones? I’ve only written one review & I took the “nice” approach. The product was fine – not exceptionally wonderful, but not even as bad as average, so I picked out the things I liked I focused on them. I didn’t play up on them but I didn’t harp on the little things. I’ve heard & read articles that it’s pretty common for bloggers to write a review if they like it & simply not write a review if they don’t (as opposed to writing an honest review). But that’s not right. Or is it? Shouldn’t we be honest with our readers in both the good & the bad – giving them the whole truth? Or do we need to protect our PR relationships? I actually read a bad review today here, courtesy of Momdot. I was so happy to read a bad review!! An honest review – it was almost all bad actually, not just a point or two. It was actually very re-assuring. And just yesterday the FTC made new rulings that bloggers (and others) must provide better disclosure. I think that’s wonderful!! The third aspect that’s totally different for me IRL as opposed to blog-world, is payment. I’m not about to pretend that I know who gets paid, what they get paid, etc. And I don’t believe that’s anybody’s concern but the two involved! But in my opinion I think anyone asked to write a review, attend a junket (again – is that the right word!?! ), or endorse a product (again, asked is the key word) in any way should be paid money – cold, hard cash. When a company pays an individual the playing field (in my opinion) is level again. If a company thinks highly enough of an individual to ask for their opinions, then I think they should think highly enough of an individual to pay them. Then it’s not about getting a “free*” product or a “free*” trip for writing a review it’s instead about a job – a consulting job for a company – either about the company or their product. Or I think of it this way – we would have been absolutely crazy if we asked participants to get off work or arrange for someone to keep their children, drive through Atlanta traffic, come and sit with us for an hour or more of their time & then the only compensation we provided was their gas reimbursement & a meal. We would have NEVER found anyone. Yet, people will travel across the country for some events. And frankly, I would be one of those people if it was a cool enough opportunity. I love the behind the scenes stuff!! But typically, people participated in our studies for two reasons – 1) they enjoyed it AND 2) they received something for it (money). I would venture to say that the reasons bloggers review products, hosts giveaways or attend junkets (there it is again) is for those same reasons – 1) they enjoy it & 2) they receive something for it – although in these cases the compensation may or may not be money – but maybe it looks good on the resume, opens up more opportunities, etc. Now I also think you (even I) could play devil’s advocate & say if bloggers get paid then they’ll become that “professional participant” because who wouldn’t want to get paid for these opportunities & do more & more of them? And I can definitely see some validity to that point. So – that’s where I’m coming from? Do you agree? Do you see it different? This whole concept is just something that’s new to me … it’s opposite of my way of thinking. I by NO MEANS think my way is the only way, I’m just curious if there are others out there that think similar to me. It’s officially fall so that means I can officially cook Chili … and not feel crazy for doing so! 8. Chili the Weight Watchers way – I think they actually call this Taco Soup, but it’s always tasted like chili to me! So what kind will you be having tonight? How do you like your chili? For more Top Ten Tuesday lists or to link up to your own post, visit ohAmanda.com.